If you are ready to close your case for any reason, you can do so in the support portal without having to contact support. If you need to re-open your case you may respond to the case and it will automatically re-open. 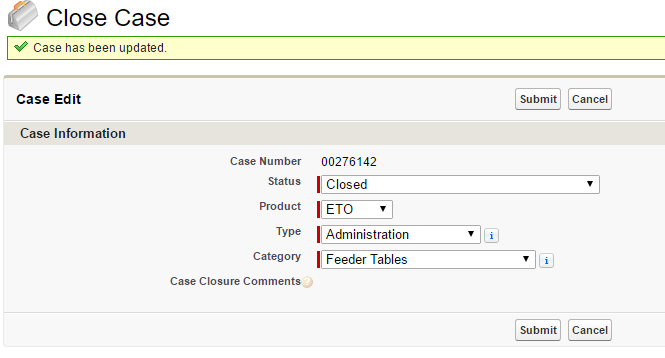 Access the customer portal via the Help link, then Support in ETO Software. Click on the Cases tab. In the View drop down select My Open Cases and click Go! Click the Edit link next to the case you want to close. 6. At the top of the page click the Save & Close button. 7. Change the status to Closed. For more information on the support portal, click here.